This year we’ve got some great gift tool ideas which are sure to satisfy the home improvement DIYers on your shopping list. So what are you waiting for, head down to your local home center and get all your gift shopping done today! 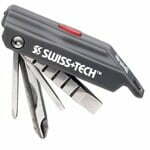 Slip your keys on the Screwz-all key ring (model# 846121), and you’ll never be without a screwdriver again! Weighing in at only one ounce, this lightweight, 7-in-1 multi-tool contains both #1 and #2 Phillips head and flat head screwdrivers, rule markings in 1/8” and 5mm, and an LED flashlight. 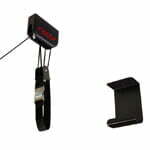 The blades are made from solid stainless steel, and the flashlight battery can be replaced if needed. Under $5 at The Home Depot. If you’ve ever tried to duplicate the shape of a piece of molding, you know how difficult it can be. The Johnson Contour Gauge (model# 220) takes the guesswork out of copying molding shapes up to 6” long. Simply press the stainless steel pins against the molding; and, voilà, you have a perfect copy of both the profile and coped molding. Great for woodworking, cabinetmaking, and flooring work. Under $8 at The Home Depot. Whether it’s cleaning up after a remodeling project or finding lost metal items, the Empire Magnetic Clean Sweep Club model# 27058) is the perfect way to keep your home and yard free of nails and screws. Simply adjust the 40” aluminum extension handle to a comfortable length, then pass the club head over the work area to pull up any hidden metal objects. Perfect for cleaning up after roofing or siding jobs to prevent flat tires or injuries. Under $13 at The Home Depot. 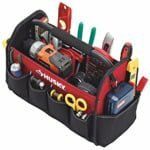 At 15” long by 7” wide, the Husky Tool Tote (model# 82042N12) is big enough hold everything from hammers to drills, but not so large as to make carrying it a burden. The 10 pockets around the outside of the bag are perfect for keeping all of your smaller tools organized. The heavy duty, water resistant fabric will last for years, and the cushioned foam grip steel handle makes carrying the tote easy. Under $15 at The Home Depot. The holding power of a wood screw is only as good as the hole you drill, and DeWALT tapered drill bits and countersinks (model# DW2535) allow you to drill the perfect hole every time! 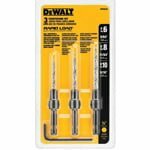 The set includes three different size high speed steel tapered drill bits with adjustable countersinks to drill holes for #6, #8, and #10 size screws. The 1/4″ Rapid Load shanks allows you to switch between drill and driver in no time. This adjustable ratcheting wrench works on both metric and standard size nuts and bolts ranging from 3/8” to 1” (10mm to 24mm), and can replace 27 different size sockets in your toolbox. The body of the Stanley TwinTec (model# STHT72123) is made of durable, lightweight composite material, and the ratchets on either end of the tool are independently reversible. Quick adjust dials on each end of the wrench allow the teeth to tighten around any shaped fastener. 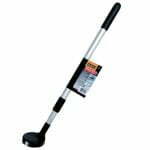 Under $30 at online retailers and through stanleytools.com. The Kreg Rip-Cut (model# KMA2675) can be attached and removed quickly to almost any circular saw. 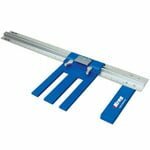 It provides accurate rip cuts in lumber and sheet goods up to 24” wide with 100% guide support throughout the entire cut. The precision aluminum guide rail has a scale and pointer to allow accurate setup without measuring. 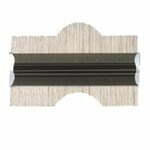 The sliding rail is reversible for left or right hand cuts, and adjusts easily. Under $35 at Woodcraft on online at kregtool.com. The Racor Ladder Lift (model# LDL-1B) uses a rope and pulley system to allow you to easily lift and store extension ladders weighing up to 150 pounds out of the way overhead at ceiling level in a garage or storage shed. The pulley system provides an eight to one mechanical advantage, which makes lifting an 80 pound ladder feel like you’re only lifting 10 pounds. The Racor Ladder Lift can be installed on ceiling up to 12’ high. Under $50 at The Home Depot. Knowing the moisture content of wood and other building materials before installation is important to prevent shrinkage or expansion. 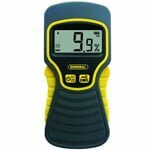 This digital moisture meter from General Tools (model # MMD5NP) is non-invasive, meaning that it doesn’t require inserting steel pins into the material to give a moisture reading. It has a sensing depth of up to 3/4”, detects moisture levels from 3% to 99%, and works on wood, concrete, plaster, drywall, and other materials. Under $60 at The Home Depot. 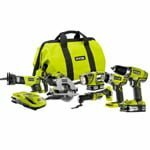 The Ryobi lithium-ion, cordless Ultimate Combo Kit (model# P884) is perfect for tackling almost any home improvement project. The kit includes a cordless drill, impact driver, reciprocating saw, circular saw, multi-purpose tool, and flashlight. It comes with two 18-volt, lithium-ion batteries, and an IntelliPort Technology charger to protect battery cells, maximize battery life, and conserve energy, along with a carrying case. Under $300 at The Home Depot. my wife and i bought 2 rentals, one townhouse and a single family. 1. the home had a deck on it and had been tied into the house. this was a long time before. The city sent use a letter two days after we changed out the elect service. it was 27ftx20ft. all hart wood. they said take it down. the man that check off the elect check the house two weeks before and said nothing about anything being wrong. 2. the town house was in great shape. right the hoa started in on use for a lot of small things.this went on for two years. we sold both homes in oct. of this year we put out 60% of our income and got back nothing. the rental co. made money from the rents the house was fha we had to put the last of our income , the town house took the rest. nothing on the plus side. ask you fanes about this and see what comes out of it.